LEARN HOW TO MAKE RISOTTO LIKE A PRO with this creamy Garlic Parmesan risotto recipe! This creamy risotto recipe is easy to make on the stove top OR in the oven! This risotto recipe is unbelievably flavorful, warm and comforting, and as easy as stirring rice! 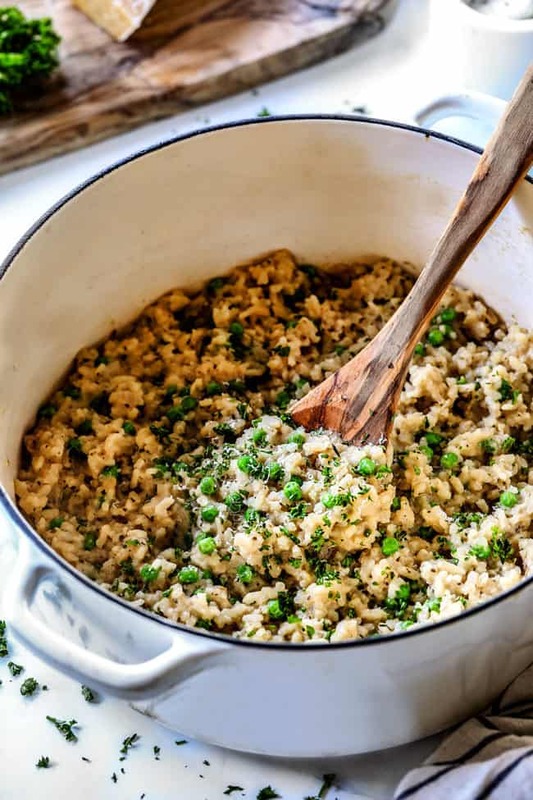 This simple Parmesan risotto is infused with shallots, garlic, Parmesan, replete with butter and never fails to impress (perfect for Easter!). The oven version is 100% foolproof and doesn’t require constant stirring or babysitting. 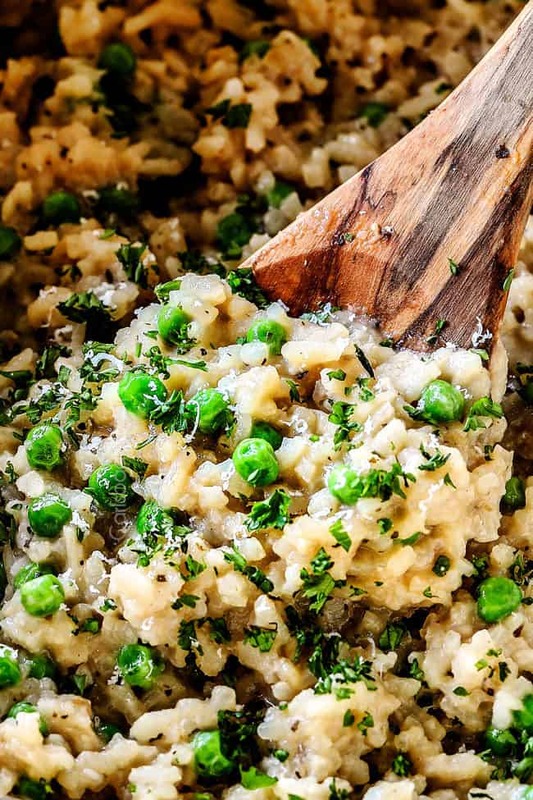 Once you make this risotto recipe once, you will be BLOWN away at how easy it is and a whole new world of risotto flavors and textures will open up! With Easter just around the corner, I have a bunch of company worthy recipes coming your way, starting with this impressive AND delicious velvety risotto! If you’ve been living a risotto-less life – stop the insanity! Risotto is unbelievably creamy, velvety, buttery, savory, salty and pure addicting – just try and stop at one spoonful! When I made this risotto recipe last week, Patrick was oohing and ahhing, gushing with comments in between bites: “amazing,” “this is the best risotto I’ve ever had,” “I’ve been all around the world and never had risotto this good,” “seriously hands down the best risotto…” And you too can make the “best risotto” with this Garlic Parmesan risotto recipe. Risotto has a reputation of being temperamental and time consuming, but it is actually super easy to make at home. The only prerequisite is that you can stir rice and have 30 minutes – that’s it to divine creamy comfort – at its most addictive. Did you know you can make Parmesan risotto in the oven? If you have been living a risotto-less life, oven risotto is the perfect way to conquer your fear. In this risotto recipe post, I’ve detailed how to make stovetop risotto and baked risotto, but baked risotto is by far my favorite. Baked Parmesan risotto eliminates all the stirring, adding broth a cupful at a time and stirring to the right consistency. Oven risotto is extremely forgiving – even more forgiving than traditional rice AND tastes just as good as stovetop risotto, in my opinion. In fact, I am so obsessed with oven risotto, I’ve already made Baked Butternut Squash Risotto and Greek Chicken Risotto and pretty much want to make everything into risotto! But for the holidays, I’m keeping it simple with this buttery, Parmesan Risotto recipe. It is classic deliciousness at its finest that pairs beautifully with Bake Ham and every possible side. But just be warned, everyone is going to want THIS side. Risotto is one of my favorite foods in the world, so, what exactly is risotto? 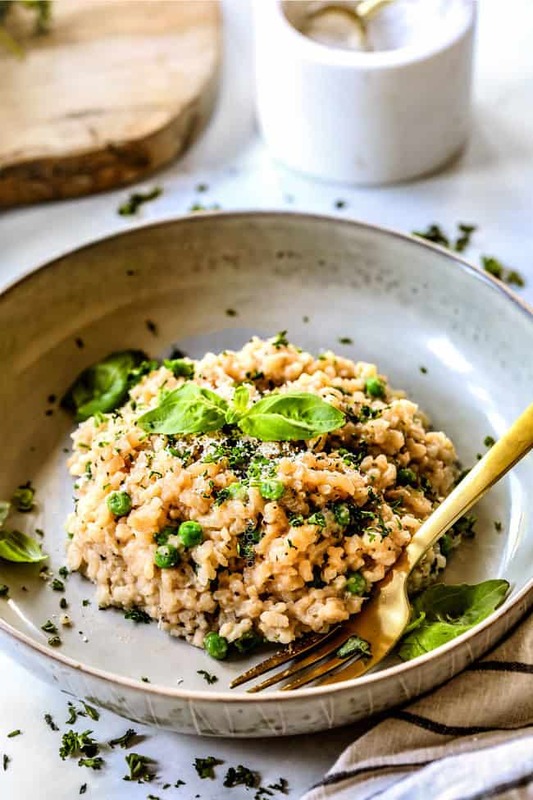 Risotto (from the Italian word for rice, “riso”) is a northern Italian rice dish slow cooked in a broth until delectable creamy consistency – it is essentially creamy rice but NOT mushy rice. Risotto is often associated with gourmet restaurants, but it is actually the epitome of Italian home cooking and very simple to prepare. In fact, most Italians will tell you risotto should require no more than 18 minutes to make. The traditional technique for making risotto calls for stirring small amounts of warmed broth into a large pot of rice a little at a time, allowing the rice to absorb the liquid then stirring in some more. This method has given home cooks the impression that risotto is too time consuming to make at home BUT my oven version solves all that and the risotto emerges every bit as heavenly without all the babysitting. What’s the difference between risotto and rice? Risotto is a type of rice dish; not all rice is risotto but all risotto is rice. 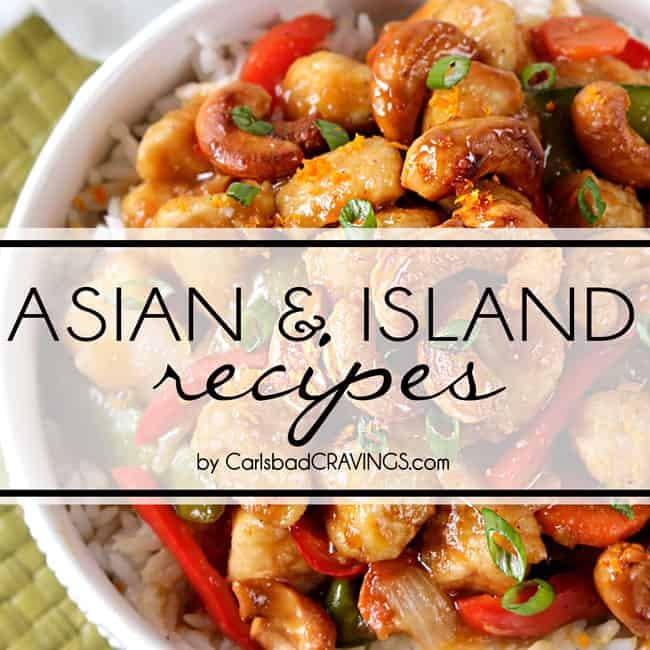 Rice can be any variety of rice and prepared in any preparation. 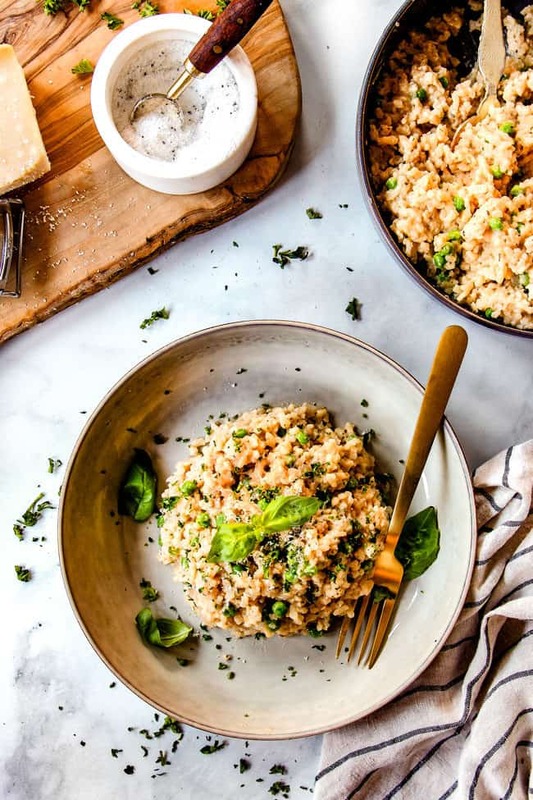 Risotto, on the other hand, should only be made with high starch short grain rice – either arborio or carnaroli – and cooked in broth to create a creamy rice dish. What is the best type of rice for risotto? 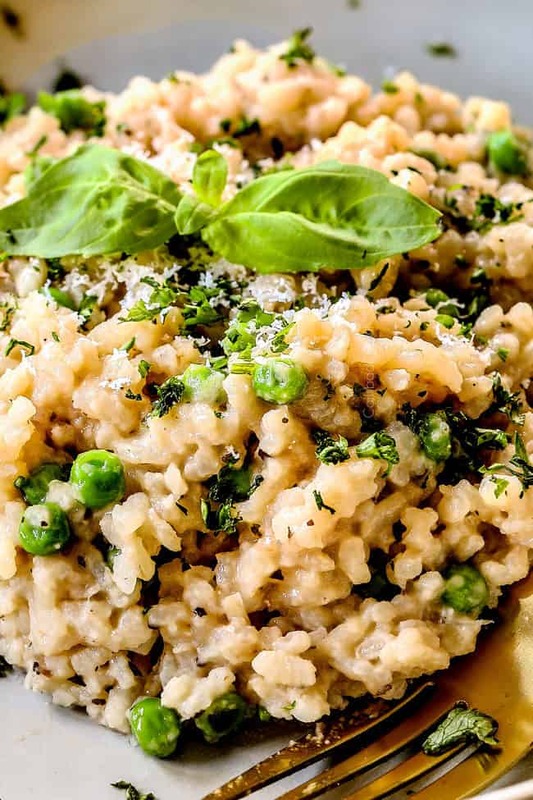 The secret to making restaurant quality risotto at home is using arborio rice. Arborio rice is a short-grained, starchy rice and is the key to creamy risotto. 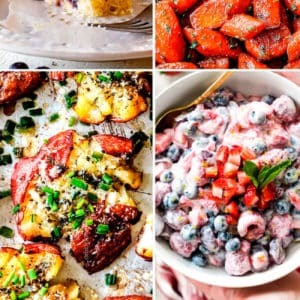 When cooked, the rounded grains become creamy and chewy due to the high starch content without becoming gluey or mushy. 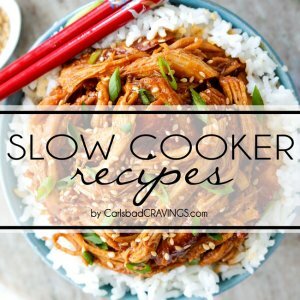 Can I Use a different rice? Arborio rice is the most common and most reliable rice for any risotto recipe. It is also easy to find at most supermarkets. You may also use carnaroli rice which is dependable and hard to overcook but can only be found at specialty markets. Please use only these two varieties of rice. 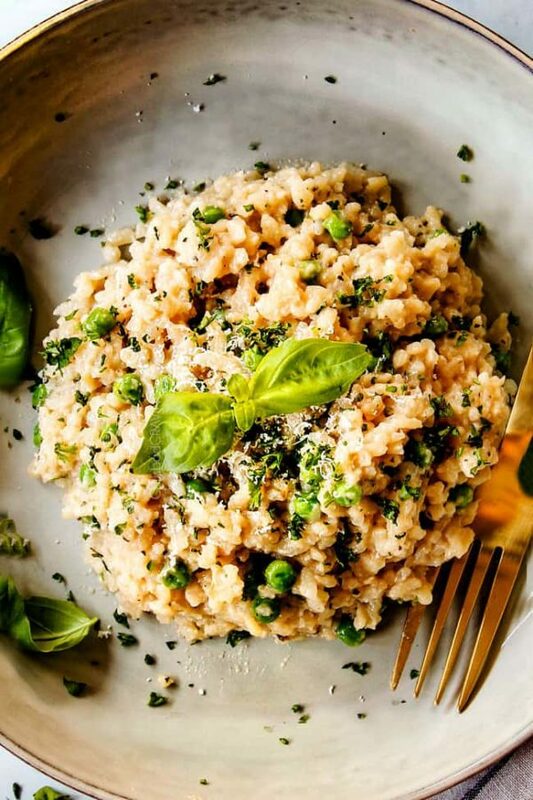 If you use any other rice variety, your Parmesan risotto recipe will not taste the same or have the correct consistency and texture due to the different starch content. For example, both basmati and jasmine rice will not work due to their low starch content. Basmati creates rice with individual grains when cooked and jasmine tends to stick together. Only arborio rice creates perfect risotto every time. Almost every grocery store carries arborio rice. It is often in a plastic container alongside the other rice varieties. If you are having trouble locating it, you can also purchase it on amazon. Do you wash Arborio rice before cooking risotto? While it is good practice to rinse most rice before cooking it to eliminate extra starch, do NOT rinse arborio rice – we WANT the extra starch to create creamy risotto. Some of the starch is released while cooking and once again while vigorously stirring. This starch adds body and creaminess to the risotto and gives it the characteristic velvety consistency. In addition to arborio rice, classic Parmesan risotto also contains butter, garlic, onions, broth, white wine, and Parmesan cheese. The broth itself can be from meat, fish, or vegetables. 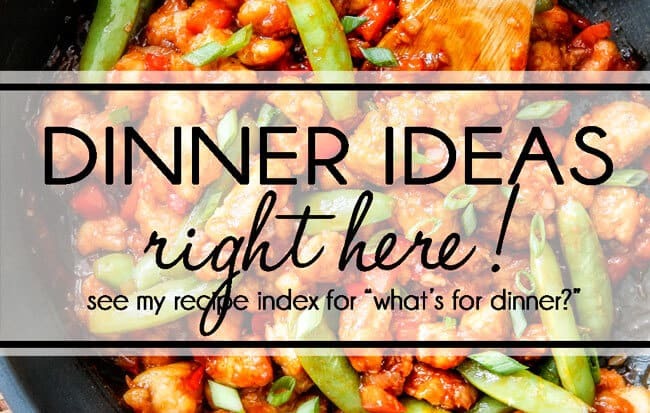 You can add any vegetables such as mushrooms, spinach, peas, zucchini, etc. 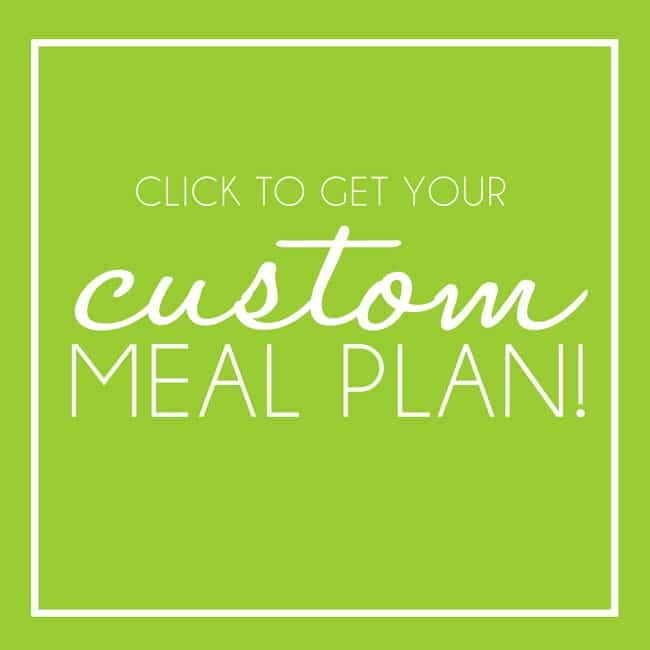 You can also add any protein to risotto, from chicken to Italian sausage to seafood such as shrimp and lobster. Parmesan is a must in authentic risotto recipe. You can use anywhere from ½ cup to one cup Parmesan. If you are looking to make Parmesan risotto, I suggest one cup Parmesan. 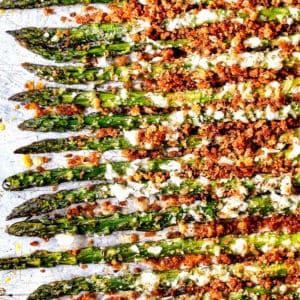 It is salty, savory and absolutely fantastic. No matter how much Parmesan you use, please only use freshly grated Parmesan cheese – NEVER the Parmesan in the green can. Freshly grated Parmesan melts and tastes far superior and will elevate your entire risotto. First, add 6 cups of chicken broth to a medium sauce pan and bring to a boil then reduce to low to keep warm throughout the cooking process. In a large, deep skillet, melt the butter then and sauté shallots followed by garlic. Add the rice and toast for about about 3-4 minutes. Add 1 cup of warmed broth to the skillet and stir until the broth is absorbed. Continue to add the broth, 1 cup at a time, until each cup is absorbed, stirring frequently. After you have added your last cup of chicken broth and there is only about 1/4 cup broth left to be absorbed, stir in salt, pepper, parsley, and Parmesan cheese; stir vigorously, then stir in peas. Continue to cook until the broth is absorbed, the rice is cooked, cheese is melted and peas are warmed through. The total process will take about 25-30 minutes. Right skillet: Use a wide skillet in order for the rice to cook evenly. Low sodium chicken broth: the broth will be reduced and absorbed into the rice so make sure to use LOW sodium chicken broth. You can add salt but you can’t take it away! 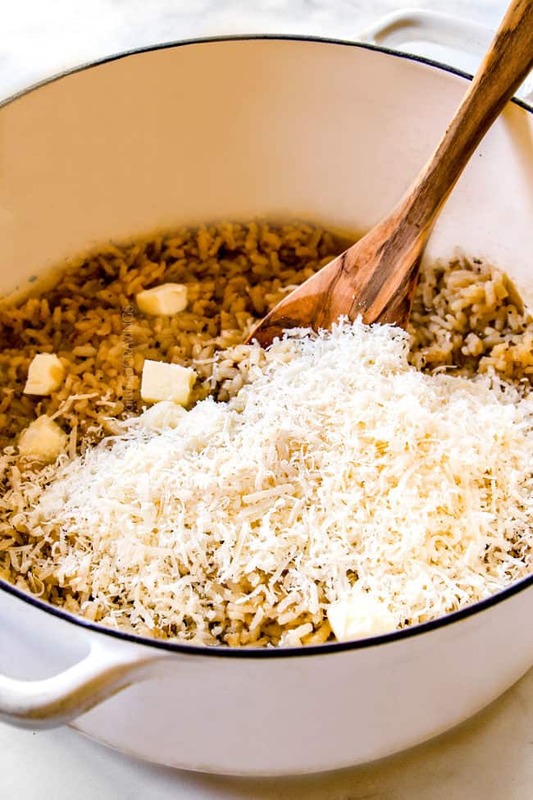 Prep ahead: have your shallots and garlic minced, your Parmesan grated and all of your remaining ingredients lined up because once you start making the risotto, you will need both hands – one for stirring and one for ladling. 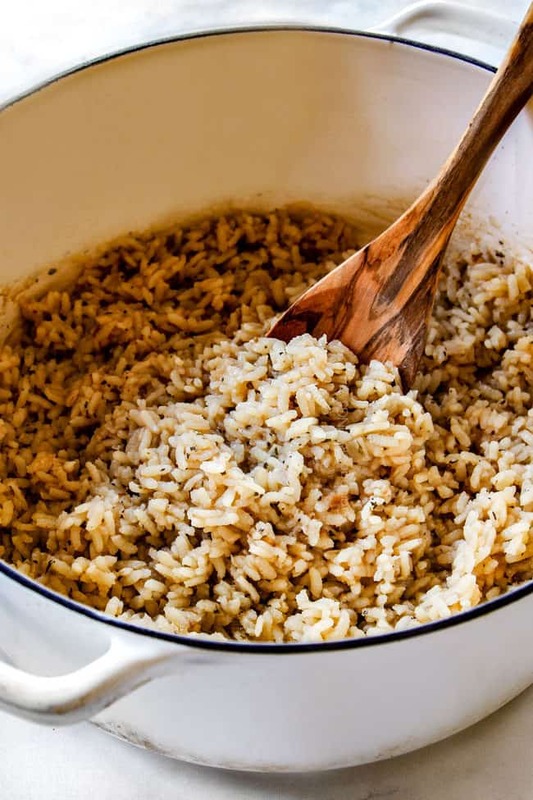 Toast rice: The brief step of sautéing the arborio rice is critical to perfect risotto. 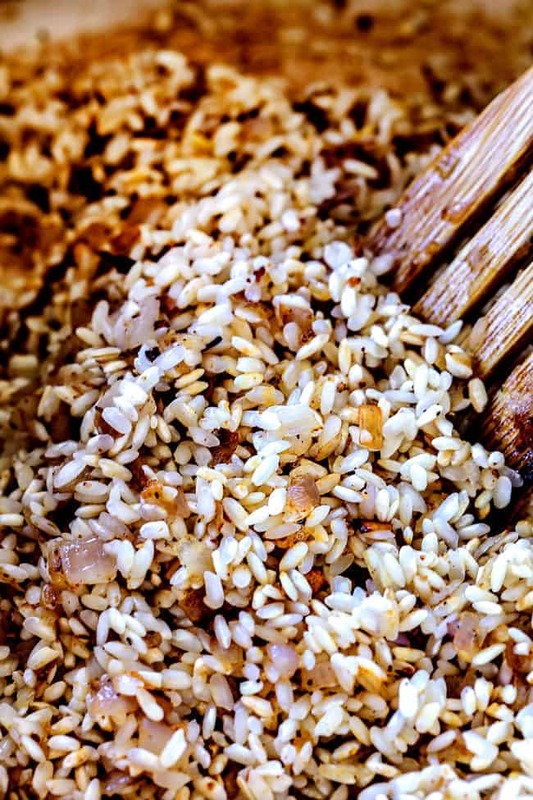 Toasting the rice not only infuses it with flavor, but more importantly, creates a protective barrier around each grain which helps the grains absorb moisture slowly. This allows the grains to maintain their structural integrity and become soft without becoming soggy or exploding from absorbing moisture too quickly. Warm broth: only use warm broth so the rice will cook evenly. Adding cold broth reduces the temperature of the rice and interrupts the cooking process. 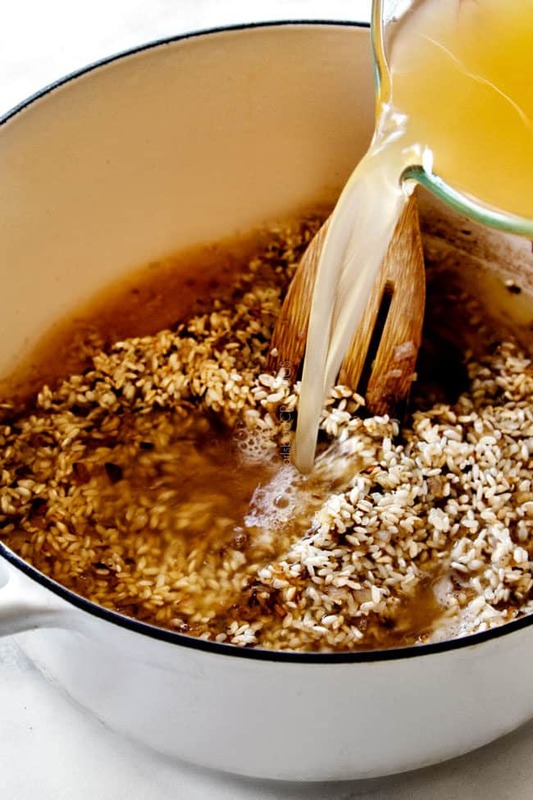 Warming the broth before adding it to the rice also releases more starch from each grain of rice whereas cold broth will cook the rice while shocking it into holding onto its starches. Add broth slowly: Add broth a little at a time. You want to add broth, then stir until most of the broth is absorbed before adding more. Don’t over-stir: You want to stir the risotto enough so the rice doesn’t stick to the bottom but don’t stir constantly. Stirring too much will incorporate air into the risotto which can make it gluey. This is different than the oven version in which you stir vigorously at the end to release the starch because you haven’t been stirring it while baking. Salt to taste: if your risotto tastes like its missing something – it is probably salt. Salt enhances all of the other flavors. Add additional salt to taste a little at a time if needed. 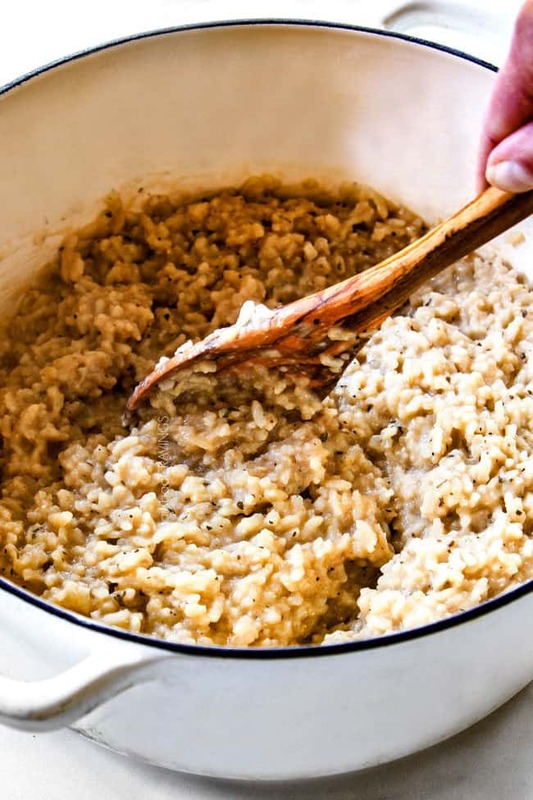 Heavy cream: heavy cream isn’t traditionally added to risotto but it is AMAZING! It makes the risotto even creamier. The only time I would not add heavy cream is if your rice is already on the saucier side, otherwise it makes a fantastic addition. Heat butter and olive oil in a large Dutch oven with a tight-fitting lid. If you don’ have a tight-fitting lid, then you can use foil, but make sure it is TIGHT otherwise the broth will evaporate before the rice is cooked, leaving you with crunchy rice. Sauté shallots followed by rice. Add rice and continue to cook for 3-4 minutes while stirring. Add warm chicken broth and seasonings. Bring to a boil, cover, and transfer to oven. Bake for 16 minutes or until rice is on the softer side of al dente. When rice is tender, remove from oven and stir in remaining, chicken broth, butter and Parmesan Cheese. Stir vigorously until smooth. Stir in peas. Stir in heavy cream or additional chicken broth if desired for even creamier risotto. Season with additional salt and pepper to taste. What is the correct consistency of Risotto? The rice in risotto should be on the softer side of al dente – slightly firm but not crunchy. The risotto should be saucy but not soupy – more like porridge. If your risotto is too crunchy but the broth is gone, simply add more broth and cook until the risotto is al dente. If you risotto is too thick, simply stir in additional chicken broth at low heat until it reaches the desired consistency and texture. 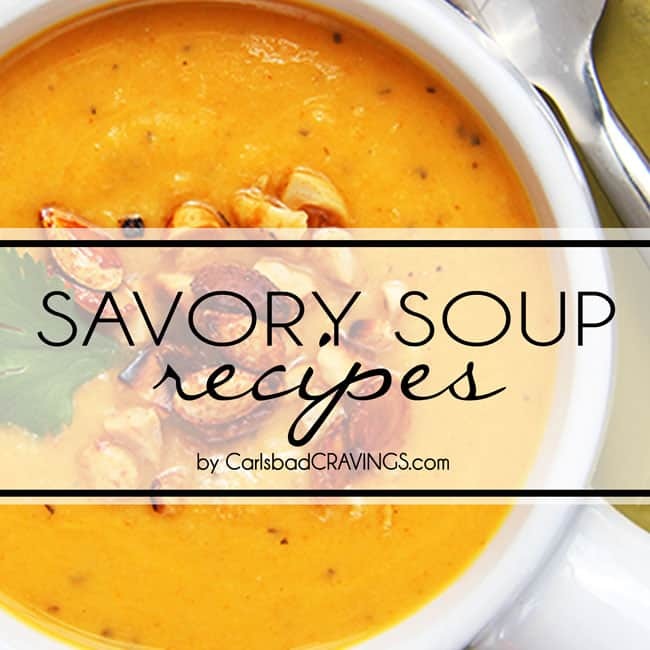 You can also stir in additional heavy creamy for extra decadence. Yes, you can overcook risotto, so be sure to check it from the oven after 16 minutes and test to see if the grains are al dente. For the stovetop, check the rice when you are almost done adding the broth – you may not need to use all of the broth. If the rice is not al dente, then continue to cook or bake just until the softer side of al dente. It’s hard to imagine there would be any leftovers of decadently delicious Parmesan risotto recipe, but I’m always very excited when there is! 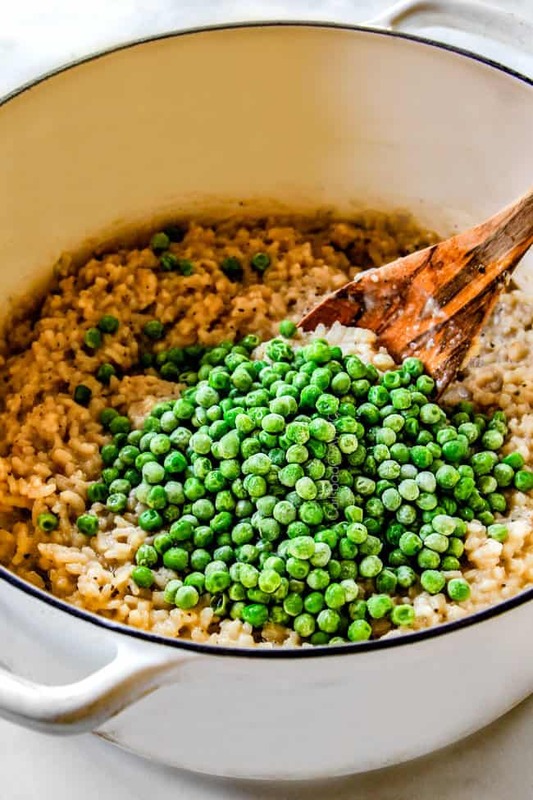 To store risotto, transfer it in an airtight container and store in the refrigerator for three to five days. Yes, you can freeze risotto, but SHOULD you? Risotto is best eaten fresh or refrigerated, never frozen. Freezing risotto will change its texture – the risotto won’t be as firm or creamy. 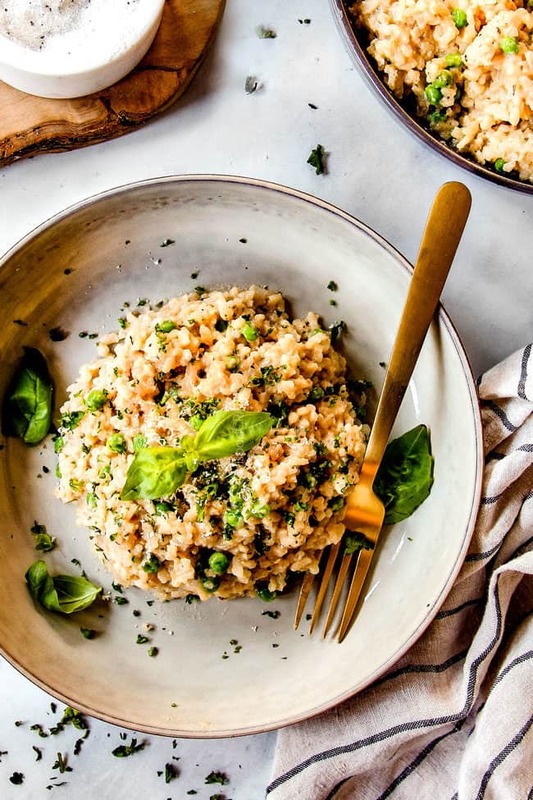 If you aren’t a stickler for perfect risotto, then make sure you let the risotto cool completely before freezing to help preserve some of the texture. Yes! All rice is naturally gluten-free and this Parmesan risotto recipe does not contain any other gluten ingredients. Is risotto a main dish? Risotto can be a side OR a main dish depending on what you add to it. This recipe for basic Parmesan risotto is considered a side dish but add chicken, shrimp, lobster, etc. and you can have a main dish. 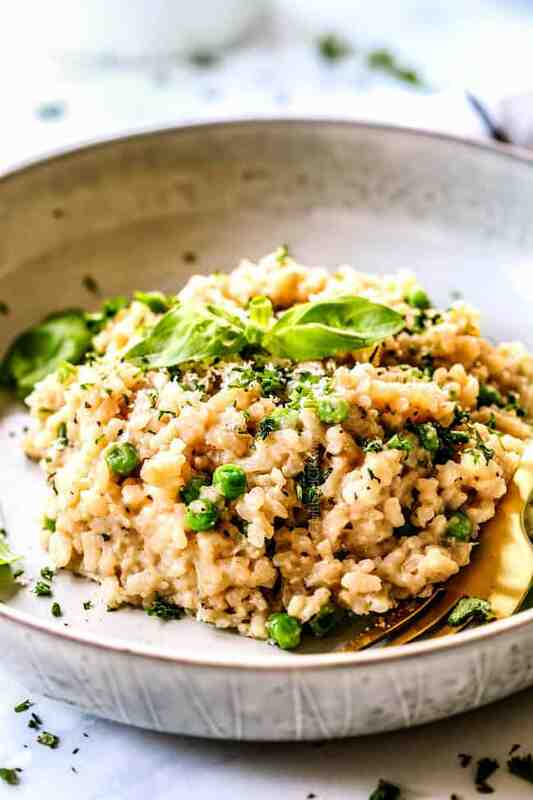 I’ve listed a lot of recipe variations below so you can make mix up this risotto for a side or main course any night of the week! What goes good in risotto? 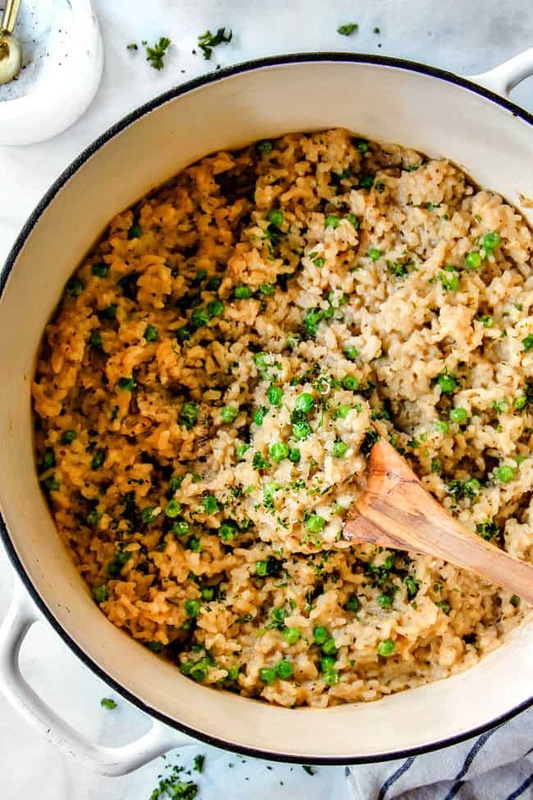 Once you make this easy risotto recipe once (specifically this EASY baked version), you will be finding excuses to add anything and everything! Fennel and lemon risotto – one of my favorite combos! 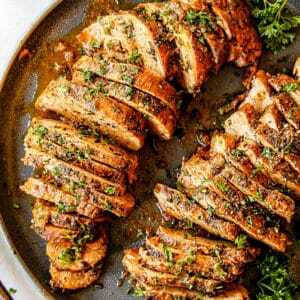 Looking for more Italian Recipe favorites? Want to try this Risotto Recipe? 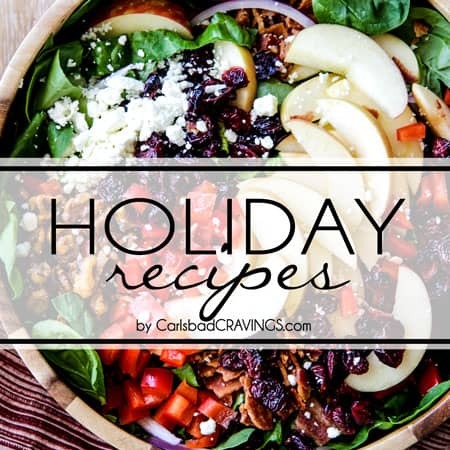 Pin it to your ITALIAN, SIDE or HOLIDAY Board to save for later! Creamy risotto is easy to make on the stove top OR in the oven! This risotto recipe is unbelievably flavorful, warm and comforting, and as easy as stirring rice! This simple risotto recipe is infused with shallots, garlic, Parmesan, replete with butter and never fails to impress. The oven version is 100% foolproof and doesn’t require constant stirring or babysitting. Once you make this risotto once, you will be BLOWN away at how easy it is and a whole new world of risotto flavors and textures will open up! Melt 2 tablespoons butter with 1 tablespoon olive oil over medium heat in a large Dutch oven with a tight-fitting lid. Add shallots and sauté 3 minutes. Add the rice and stir until well coated with butter and edges begin to look translucent and mushrooms are lightly browned, about 3 minutes. Add garlic and sauté an additional 30 seconds. Add 4 1/2 cups warm chicken broth and seasonings. Bring to a boil, cover, and transfer to oven. Bake for 16-20 minutes or until rice is the softer side of al dente. When rice is tender, remove from oven and stir in remaining 1/2 cup chicken broth, 3 tablespoons butter (cubed) and Parmesan Cheese. Stir vigorously until smooth. Stir in peas. Stir in heavy cream or additional chicken broth if desired for an even creamier/saucier risotto. Season with additional salt and pepper to taste (I add both). Add 6 cups of chicken broth to a medium sauce pan and bring to a boil. Reduce to low to keep warm while you make the risotto. In a large skillet, melt 2 tablespoons butter with one tablespoon olive oil over medium heat (you will keep the heat at medium until finished cooking). Add mushrooms and shallots; sauté 3 minutes. Add the rice and stir until well coated with butter and edges begin to look translucent and mushrooms are lightly browned, about 3 minutes. Add garlic and sauté an additional 30 seconds. Add 1 cup of warmed broth to the skillet and stir until the broth is absorbed. Continue to add the broth, 1 cup at a time, until each cup is absorbed, stirring occasionally. After you have added your last cup of chicken broth and there is only about 1/4 cup broth left to be absorbed, in the skillet, stir in 3 tablespoons butter (cubed), seasonings, peas and Parmesan cheese. Continue to cook until the broth is absorbed, the rice is cooked, cheese is melted and peas are warmed through. Stir in heavy cream or additional chicken broth if desired for an even creamier/saucier risotto. Season with additional salt and pepper to taste (I add both). Your oven technique for risotto is a genius idea! It’s so easy and the risotto comes out creamy every single time. It makes me wonder why anyone does it on the stovetop. 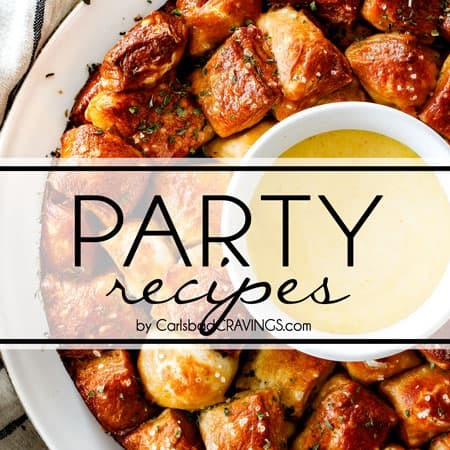 🙂 My husband and I LOVE all your recipes – I view each one of them as a little jewel you give us. The spice combinations you come up with give multi-dimensional, well-rounded, and irresistible flavors. I’ve made over 250 of your recipes; and my husband’s most requested dinner is your Greek Chicken Risotto. So, so, so good!! And now we’re adding the Garlic Parmesan Risotto to the “must make often” list. Thanks for all you do to help us all become better cooks and for the wonderful flavors you come up with. I appreciate you! Thank you SO much Liz, your comment absolutely made my week – I appreciate YOU! 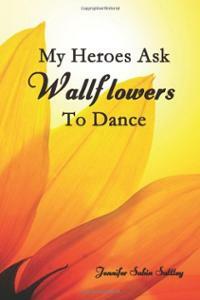 I am honored – and impressed! 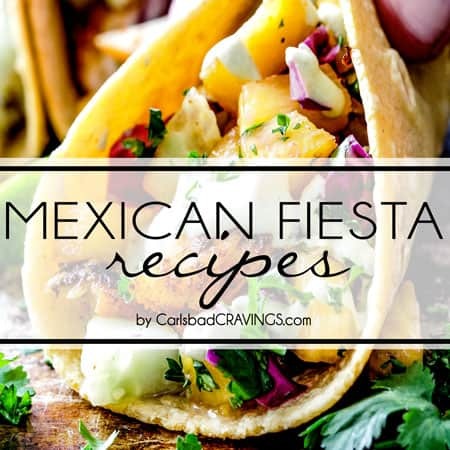 – you have made 250 of my recipes! I’m so pleased you love the oven risotto technique as much as me. I also love hearing that the Greek Chicken Risotto is your husband’s most requested dinner – you have great taste! 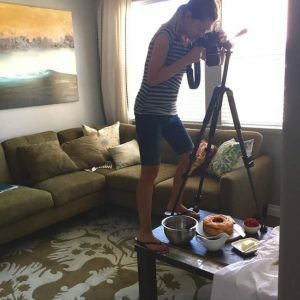 Thanks for taking the time to comment and to make my recipes! Sending you a big hug! I made the Garlic Parmesan Risotto using the oven baking technique last week for dinner. So Easy! And beyond delicious. It was beautiful to look at, too, with the bright green peas and herbs. I can hardly wait to make it again. Thanks so much for introducing me to this oven baking technique. While the risotto was baking I had time to prep and cook the shrimp (brown butter and garlic) to complete the meal. Hi John, I’m thrilled you loved the oven risotto! And your brown butter garlic shrimp sounds like the perfect companion – yum! 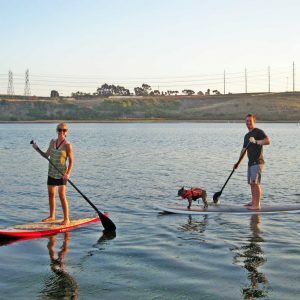 Thanks for taking the time to comment!